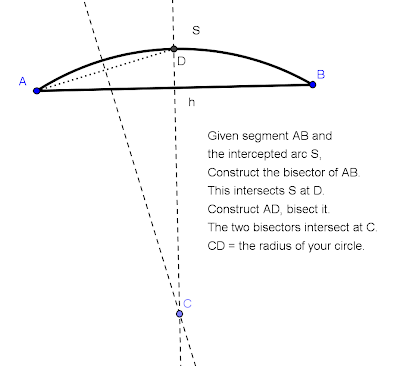 Given a chord AB and the intercepted arc S, is it possible to find radius r algebraically? (problem stated at f(t)) The consensus there seems to be no, due to the transcendental nature of sin(x). Update: http://www.mathforum.com/dr.math/faq/faq.circle.segment.html#1 Dr. Math has a nice page about solving circles given arbitrary parts. They reinforce the idea that this is a problem with numerical-only solution. Their solution involves Newton’s Method, something I myself am not very well versed in these days! At first glance, one might arrive at the conclusion that AIG was using almost its ENTIRE bailout for these bonuses. “How irresponsible! What an outrage! Despicable!” But upon closer inspection, one notices the difference between the numbers. What if we actually took the difference? There’s $165 million is a drop in the hat. Its about 0.1% of the bailout money. It pales in comparison! It should not be compared. I’m not defending AIG. That’s not the issue. The issue is the News Media is presenting information in a misleading format. I also assert the News Media is doing so purposely. They want the outrage, because outraged viewers will watch more. Everything is sensationalized and distorted. The new propoganda isn’t for political gain. The Media wants your viewership and your money. They will distort the facts for it. Our financial crisis is a result of people misrepresenting information about loans rates, feasibility of real estate transactions, investment options and the market in general. People would bend the truth to gain more money. 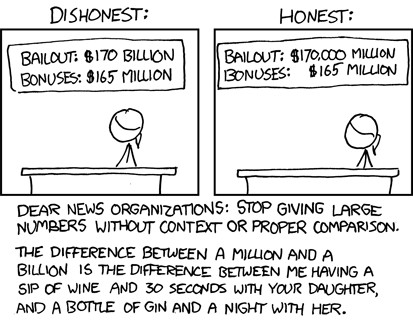 Now, the News Media is now misrepresenting information… to gain more money. They mimic the actions of the very organizations they codemn. “Why do we have to take math?” students ask me. Look at the world. Those who understand the system will take advantage of those who do not. A simple concept like orders of magnitude (billions vs. millions) will be lost on many viewers who have been in the habit of non-mathematical thinking.